The brother of the man identified as the gunman in what's being called the deadliest mass shooting in recent U.S. history was at a complete loss early Monday to explain what might have precipitated the attack. Stephen Paddock's brother, Eric Paddock, who lives in Florida, told the Orlando Sentinel: "We are completely dumbfounded. We can't understand what happened." Stephen Paddock, 64, unleashed bullets onto the Las Vegas street from a 32nd floor room at Mandalay Bay. Many of the victims were enjoying a concert performance by country music star Jason Aldean at the time of the shooting Sunday night. 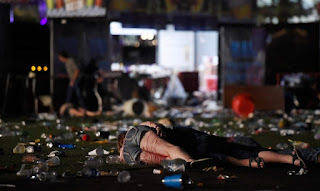 By the time police had identified and approached the room, Paddock had killed himself. Authorities weren't clear how long it was before police arrived at the room that he committed suicide. Officials said in a Monday morning news conference that 58 have been pronounced dead, with 515 injured. In an address to the nation, U.S. President Donald Trump called it "an act of pure evil." Sheriff Joseph Lombardo said authorities believe it was a "lone wolf" attack. The U.S. Homeland Security Department said there was no "specific credible threat" involving other public venues in the U.S.
Lombardo said there was no evidence he was linked to a militant group despite the customary claim of responsbility by ISIS following attacks in the West. Paddock did not have a criminal record, according to police. Lombardo said police found "in excess of 10 rifles" in Paddock's possession, and that all items from the Mandalay Bay room have been seized as part of the investigation. He broke the window in his room with a hammer-like device before shooting. Paddock had checked into the hotel room on Thursday, authorities said, and police will examine surveillance video to try to get a handle on his movements in the days leading up to the mass shooting. There was no indication anyone else helped Paddock transport the weapons into Las Vegas and his room, Lombardo said. 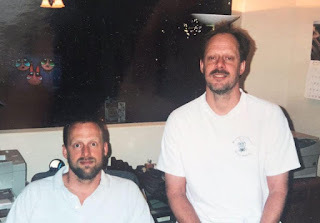 Eric Paddock said his brother owned guns, but to his knowledge had never drawn one in anger. He said Paddock was a Florida resident before moving to Nevada two years ago.